Kick off your visit on the 10th (Sun): enjoy the sand and surf at Freedom Beach, stop by Niphon's Rich Collection, and then head outdoors with Nai Harn Beach. On the 11th (Mon), you'll have a packed day of sightseeing: enjoy the sand and surf at Rawai Beach, contemplate in the serene atmosphere at Wat Chalong, and then tour the water at your own pace with La Moet Phuket. For more things to do, maps, reviews, and tourist information, read our Rawai trip planner . Newark, USA to Rawai is an approximately 25-hour flight. The time zone changes from Eastern Standard Time (EST) to Indochina Time (ICT), which is usually a 12 hour difference. 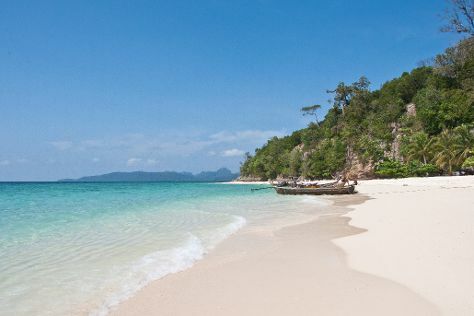 In February, Rawai is much hotter than Newark - with highs of 91°F and lows of 73°F. Finish your sightseeing early on the 11th (Mon) to allow enough time to travel to Ko Phi Phi Don. Start off your visit on the 12th (Tue): enjoy the sand and surf at Laem Tong Bay, then head off the coast to Bamboo Island, and then kick back and relax at Long Beach. On the 13th (Wed), you'll have a packed day of sightseeing: don't miss a visit to Koh Phi Phi Viewpoint, enjoy the sand and surf at Monkey Beach, then Head underground at Ko Phi Phi Le, and finally Head underground at Viking Cave. For traveler tips, other places to visit, and tourist information, read our Ko Phi Phi Don online trip planner . Do a combination of taxi and ferry from Rawai to Ko Phi Phi Don in 1.5 hours. Alternatively, you can do a combination of bus and ferry. In February, daytime highs in Ko Phi Phi Don are 93°F, while nighttime lows are 71°F. Finish your sightseeing early on the 13th (Wed) so you can ride a ferry to Ko Lanta. Escape the urban bustle at Kantiang Bay and Lanta Klong Nin Beach. Step off the beaten path and head to Long Beach and Lanta Old Town. Spend the 14th (Thu) among aquatic life with a scuba or snorkeling tour. There's much more to do: look for all kinds of wild species at Lanta Animal Welfare, take a peaceful walk through Thung Yee Pheng Mangrove Forest, and stop by Fashion Point. To find photos, where to stay, reviews, and more tourist information, go to the Ko Lanta online vacation maker . Ride a ferry from Ko Phi Phi Don to Ko Lanta in an hour. In February, plan for daily highs up to 93°F, and evening lows to 70°F. 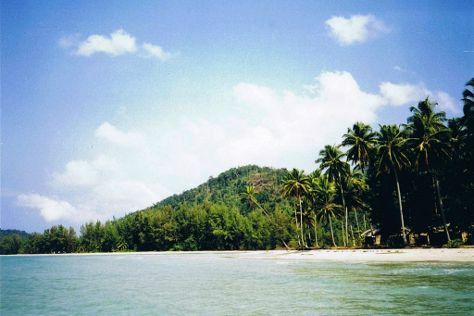 Cap off your sightseeing on the 16th (Sat) early enough to travel to Ko Chang. Ko Chang means "Elephant Island" and, though elephants are not indigenous to the island, visitors certainly see plenty of them on tours of protected reserves. Start off your visit on the 17th (Sun): take in the dramatic scenery at Klong Plu Waterfall, enjoy the sand and surf at Khlong Prao Beach, and then kick back and relax at White Sand Beach. Here are some ideas for day two: enjoy the sand and surf at Kai Bae Beach, then see some colorful creatures with a scuba or snorkeling tour, and then contemplate in the serene atmosphere at Chao Por Koh Chang Shrine. To see traveler tips, maps, reviews, and more tourist information, go to the Ko Chang route planner . Explore your travel options from Ko Lanta to Ko Chang with the Route module. Expect a bit cooler weather when traveling from Ko Lanta in February: highs in Ko Chang hover around 88°F, while lows dip to 72°F. Cap off your sightseeing on the 18th (Mon) early enough to travel to Bangkok. Kick off your visit on the 19th (Tue): take in the spiritual surroundings of Temple of the Emerald Buddha (Wat Phra Kaew), take in the spiritual surroundings of Wat Pho, then step into the grandiose world of The Grand Palace, and finally see the interesting displays at Jim Thompson House. To find reviews, other places to visit, ratings, and more tourist information, you can read our Bangkok trip planner . Traveling by combination of car, ferry, flight, and train from Ko Chang to Bangkok takes 4.5 hours. Alternatively, you can do a combination of car and ferry; or do a combination of taxi, ferry, and shuttle. February in Bangkok sees daily highs of 91°F and lows of 75°F at night. Wrap up your sightseeing by early afternoon on the 20th (Wed) to allow enough time to travel back home.